Are Enterprises Really Ready for True Social Collaboration? Here Is A Dedicated Facebook For Your Company! For enterprise, you’re probably looking for world-class security, custom behind-the-firewall deployment options, and a single product to tie together all of your business activity. We narrowed the list down to our top recommendations. MangoApps – The MangoApps feature list is unrivaled in the amount of collaboration and secure, instant communication that can be accomplished with this simple application. MangoApps comes standard with robust project management, task management, and document management capabilities relieving the need for additional products and cumbersome integrations that are available from other offerings. 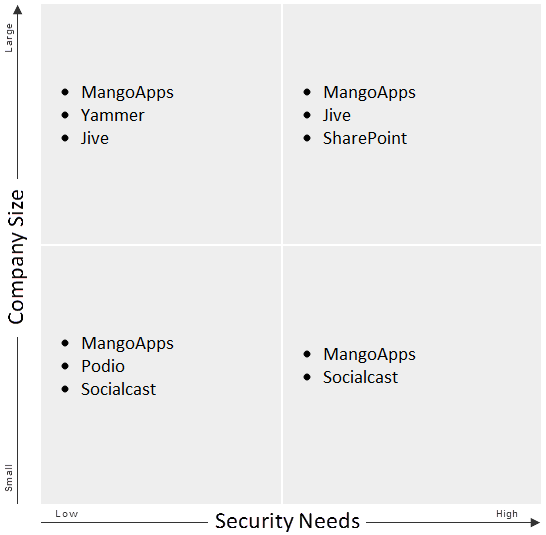 With multiple deployment options and a fantastic price point, MangoApps is the top recommendation. Jive – A leader in the collaboration software space, Jive is one of the clear favorites. On-premise security, integration with top 3rd party vendors, and delivering solid collaboration features help raise Jive to the upper echelon of solutions. The price of deployment and the ease-of-use leaves room for other social collaboration offerings to move in on Jive’s impressive customer base. Socialcast by VMWare – A great tool for collaboration, Socialcast has interesting features such as Town Hall: a moderated forum for executives and employees to discuss issues. While external collaboration from clients and customers is a key feature of Socialcast, an easy document management process needs improvement to gain in usability between internal and external collaborative documents.